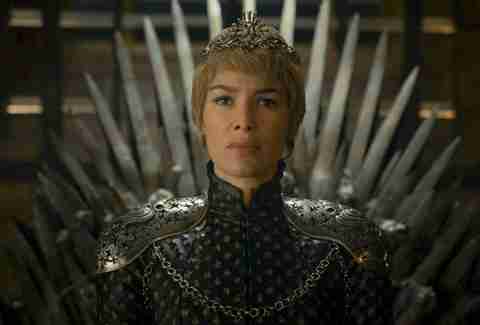 This article contains spoilers through the final episode of the sixth season of Game of Thrones. For more theories and speculation, head to our Game of Thrones page. The wait for Game of Thrones Season 7 will be a long one. While the series typically returns in the April of every year, beginning each spring with the smell of freshly decapitated corpses, the show's abbreviated seventh season will not kick off until summer 2017 at the earliest, giving us extra time to speculate wildly about what revelations the final batches of episodes will hold. Ever since the death of Ramsay Bolton at the hands of his hungry, hungry hounds, there's been discussion about the the villain vacuum on Game of Thrones. With Ramsay, Joffrey, and the High Sparrow all gone, who will torment us every Sunday night? 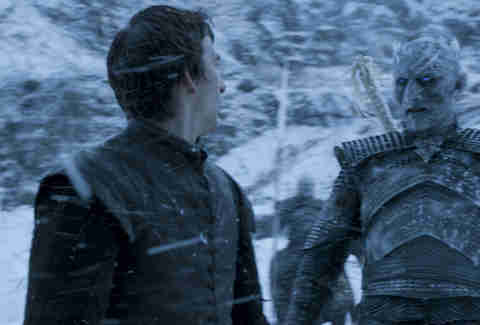 One idea is that the Night King, who typically drops by once a season to commit some horrible act of violence, will step up to fill the void. But according to Benioff and Weiss, the frosty undead leader is not the villain you're looking for. "We don't think of the Night King as a villain as much as Death," the pair write in the interview. "He is not someone who's like Joffrey or Ramsay. He's not really human anymore. Evil comes when you have a choice between that and good, and you choose the wrong way. The Night King doesn't have a choice; he was created in that way, and that's what he is. In some ways, he's just Death, coming for everyone in the story, and for all of us." What does that mean going forward? It's hard to say, especially because "he's just Death" is a metaphoric way writers often talk about textbook "villains" like the Joker or Anton Chigurh. In the interview the pair say it's appropriate that the Night King doesn't speak, so don't expect a series of scenery-chewing monologues to come from his blue, icy mouth anytime soon. He probably won't join forces with Daenerys and ride a dragon around. Instead, it seems more likely that the show's newer antagonists, like the Joshua Jackson-looking bad dude Euron Greyjoy, will take on a larger role in Season 7. And, as the map becomes smaller, it's likely some of our heroes could become a bit more villainous -- maybe it's time for Sansa to break bad? Of course, there's the newly crowned Queen Cersei to contend with, and judging from the fireworks display she put on in last season's finale, she's probably got a few more tricks up her long black sleeves. Speaking of Cersei, while Benioff and Weiss kept tight lips when it comes to spoilers throughout the interview, they did speculate about the Queen's incoming reign. After noting that she bears some responsibility for the death of her son -- we still miss you Tommen, you ineffective little boy-king -- the creators explained that the next season will likely take us deep inside Cersei's psyche. Scary, right? "That's what so much of next season is going to be about," they write. "Finding out what Cersei's mindset is, and who is she? Cersei has certainly done a lot of horrible things in her life and she could be a very cruel person, but the one thing that was redemptive about her was she genuinely loved her children. Now they're all gone, and I think that is very interesting for us. Who is she, without her children? The answer is something you'll find out about next season." 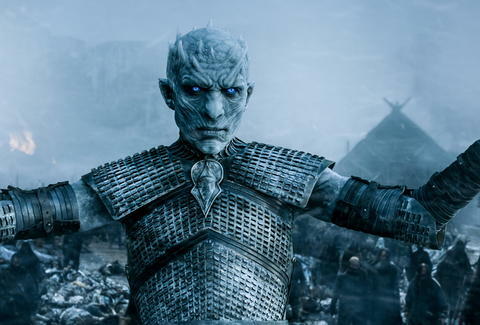 Even though Benioff and Weiss don't consider the Night King to be the show's primary villain, the plot's momentum suggests he'll eventually have to get past that damn Wall and unleash icy hell. After all, winter is coming, as the saying goes. Fans have long speculated that an object mentioned in the books, the Horn of Joramun, will ultimately be used to bring down The Wall, but by now show-watchers know that Benioff and Weiss have been known to zig when George R.R. Martin zags. "We don't want to give away too much," the pair writes. "There are the books, and the show, and it would be a disservice to both if we went into too much detail of, we're going to use this or that. We're not using that. 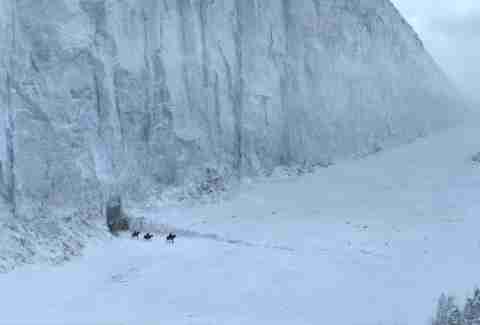 What's laid out in this season is, very clearly, The Wall isn't just a physical structure that is keeping the army of the dead out. If it were, and if the wildlings managed to make it over, at least in theory someone like the Night King has so much more in the way of both power and troops who'll do literally anything he says." Let's take a closer look at the quote: when Benioff and Weiss say, "We're not using that," they may not be talking specifically about the Horn of Joramun. Instead, it seems like they were speaking more generally about their collaborative process with George R.R. Martin, particularly which elements they choose to use and which they don't. So, the Horn of Joramun is still in play as a possible way for The Wall to fall -- or the pair of writers could totally swerve from what's expected, Lady Stoneheart-style, and surprise us with something totally different. There's only one way to find out: get a time machine that takes us to summer 2017 when the show returns. Or, just keep theorizing.